PUTRAJAYA, 27 June 2016 – Malaysia has made significant progress in the past six years in increasing the number of women in the workforce and in decision-making role in the corporate sector on the back of several Government initiatives rolled out to enhance the contribution of women to Malaysia’s economy and promote greater inclusiveness in the workforce, said YAB Prime Minister Dato’ Sri Mohd Najib Tun Abdul Razak today. The Prime Minister was speaking at a Women in the Workforce Dialogue organised by Talent Corporation Malaysia (TalentCorp) with a group of women representing those who have returned to work under TalentCorp’s Career Comeback Programme. Also present were senior representatives from some of the companies who have implemented measures to retain and facilitate the return of more women to the workforce. Companies represented were BASF Asia-Pacific Service Centre, CIMB Group, IBM Malaysia, IHS Global (Malaysia), Intel Malaysia, PwC Malaysia, Sunway Group and UEM Group. 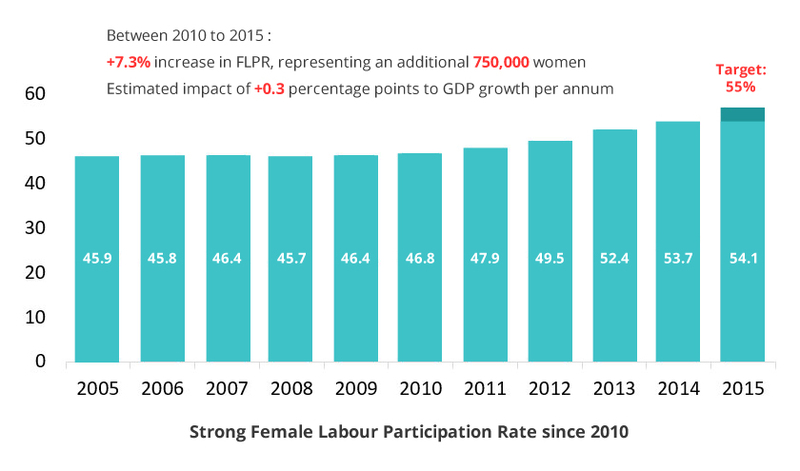 The Prime Minister announced that Malaysia’s Female Labour Participation Rate (FLPR) climbed to 54.1 percent in 2015 from 46.8 percent in 2010. While this is just under the 55 percent target set for 2015, the 7.3 percent increase in FLPR has resulted in an additional 750,000 women entering the workforce. This is estimated to have contributed an additional 0.3 percentage points to GDP growth per annum . Prior to 2010, the FLPR remained at around 46 percent for at least five years. Meanwhile, Malaysia is on track to meet its 30 percent target of women in decision-making role in the corporate sector by 2016. Based on annual returns compiled by Bursa Malaysia across all public-listed companies (PLCs) in 2015, women held 26.3 percent of top management positions across PLCs. However, this percentage increased to 28.4 percent for women in top management positions in the top 100 PLCs (representing a market capitalisation of 82 percent). This marks a substantial improvement from a diversity survey of listed companies conducted by TalentCorp and PwC in 2013 which found that women held 24 percent of top management positions. In line with the objective of inclusiveness in the New Economic Model, which emphasises diversity as a source of strength, the Government has introduced various measures to encourage the corporate sector to strive for greater inclusiveness, especially at leadership and top management levels. Starting 2014, all PLCs were required to establish and disclose in their annual reports their diversity policies, covering gender, ethnicity and age for board and management. Recently, in April 2016, the Prime Minister announced that the policy and disclosure of management and workforce composition be made mandatory for all PLCs. In Budget 2015, the Prime Minister announced the Career Comeback programme to incentivise employers to recruit and retain women who have been on career breaks. Together with the Ministry of Women, Family and Community Development (MoWFCD), TalentCorp introduced two grants – the Resourcing Grant and the Retention Grant – to encourage employers to attract and retain women who have been on career breaks for more than six months. Under the programme, more than 200 women professionals have returned to the workforce last year. Additionally, the Government has introduced measures for a more family-friendly workplace and work-life integration. The flexWorkLife.my initiative was launched in 2013 by MoWFCD and TalentCorp to promote awareness of work-life integration and sharing of employers’ best practices of flexible work arrangements. “While Corporate Malaysia has adopted flexible work arrangements as a strategy to attract and retain more women in the workforce, more can still be done as less than 30 percent of companies in Malaysia offer flexible work arrangements,” said Shareen Shariza Dato’ Abdul Ghani, chief executive officer of TalentCorp, who spoke at the dialogue. 1AZAM programme which was piloted in Iskandar Malaysia in 2011 and has since been expanded to other states due to its success in raising income levels of its participants through various initiatives such as Azam Niaga, Azam Khidmat, Azam Tani and Azam Kerja.